Since our inception, Bright Software has recognised that in order to increase mobile worker productivity, reduce operational costs and deliver true business mobility solutions, our customers must be provided with a re-usable platform that will enable the rapid design, development, deployment and maintenance of mobility applications for all business units within the organisation. Without the appropriate technologies, tools and products, creating cross platform robust scalable enterprise mobility solutions can be a very complex, costly and risky exercise. Organisations with mobile field forces need to ensure that the underlying technology offered provides a solid proven platform to achieve their mobility goals, and future proof their investments. BrightXpress Mobility Suite is our technology offering that is specifically architected and designed to create end-to-end mobility solutions. BrightXpress Mobility Suite is an out-of-the-box complete integrated platform that eliminates all the risks and complexities for businesses to maximise their return on investment from field operations. Creating robust and effective business mobile solutions is not an easy task. BrightXpress Mobility Suite addresses many of the challenges that businesses and mobile solution providers face on a regular basis. BrightXpress Mobility Suite is a complete integrated end-to-end mobility platform for designing, developing and deploying business mobile solutions. It is designed to help organisations to achieve their true efficiency in mobile field operations in order to deliver a higher return on investment from their field operations. 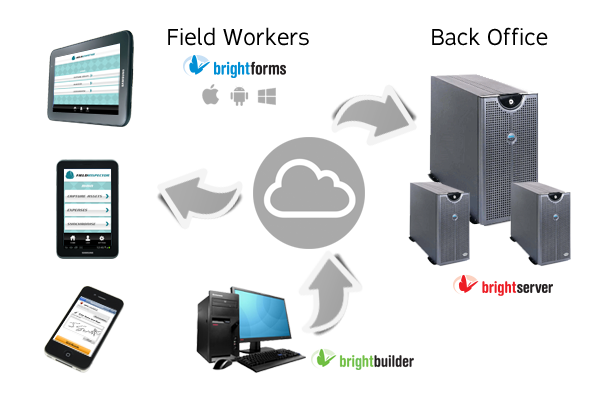 BrightXpress Mobility Suite handles all the aspects of the mobile solution development, deployment and management. Its application development tools allows the creation of advanced powerful applications with support for barcode scanning, mobile printing, GPS, magnetic card reading and more. BrightXpress Mobility Suite runtime environment provides powerful data synchronisation engine to exchange business data between remote mobile devices and the back office systems. It provides a secure channel to send and receive sensitive business data. It is designed to run on various networks including low bandwidth or fully digital packet based networks. In addition to an “always-on” online mode of operation, the device engine allows users to work offline and collect data when the communications channel is not available. BrightXpress Mobility Suite comes with fully configurable easy-to-use integration tools to provide seamless field extensions of any back office systems to mobile remote users in the field.